Now this is cool: Google’s (S GOOG) Chromecast team has found an interesting way to pair Chromecast streaming sticks with mobile devices that are not on the same Wi-Fi network. Pairing is done through inaudible, ultrasonic sounds, which should make sure that your neighbor won’t suddenly rickroll your TV screen. Google first announced support for off-network casting at its Google I/O 2014 developer conference in San Francisco Wednesday, and Chromecast Engineering Manager John Affaki said during a presentation at the conference Thursday that the goal was to make the social use of Chromecast in the living room easier. Google’s YouTube app already allows users to build collaborative queues for on-the-fly YouTube parties, and Affaki said Thursday that the support for these kinds of queues will be added to the Chromecast software developer’s kit to bring it to other apps as well. However, the challenge is that users need to be on the same Wi-Fi network, and sharing Wi-Fi passwords can be cumbersome. “The initial step of getting on the same Wi-Fi network can be really complicated,” said Affaki. The new pairing feature will enable users to cast their content even if their phone is connected to a mobile network. 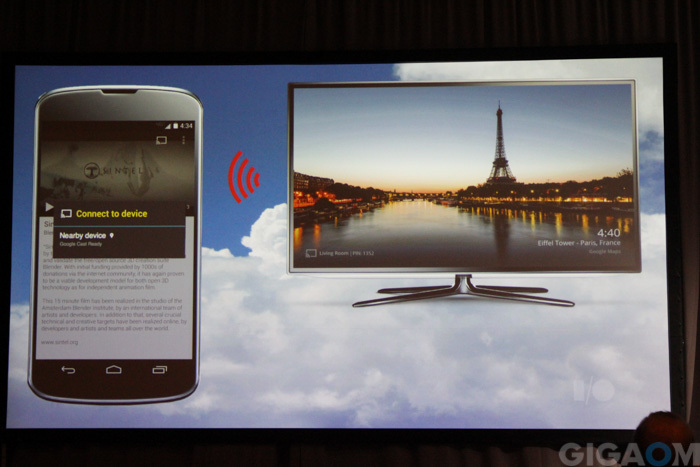 To enable this, Chromecast owners have to first allow support for nearby devices. After that, any user in the vicinity of a Chromecast can request from within any cast-enabled app. The Chromecast streaming stick then plays a unique ultrasonic sound through the TV’s loudspeakers. That sound won’t be audible by human ears, but a mobile device in the same room will be able to pick it up and pair with the TV. Alternatively there will also be a four-digit pin displayed on the TV screen, making it possible to manually pair both devices. The idea of ultrasonic networking was originally conceived by Google engineer Boris Smus, who published an experimental web app using ultrasound for messaging and pairing on his website last year. Google also announced support for customization of the Chromecast home screen, including personal photos, weather and news content. All of this will come to Chromecast in the coming weeks. Nice but how do I find the pairing codes for using the. Chromecast on my Samsung TV? I did not have to do this originally when I hooked up my chromecast now its making me look for a pairing code! To the comments about audio networking… this isn’t exactly what’s being suggested here, as far as using it for actual data transfer. It’s just for the pairing, so the Google cloud knows which Chromecast to send phone’s results to. This would be really cool to have in the home, but I believe Polycom has been doing this for over a year now – “throwing” a meeting from a tablet onto a larger screen in the vicinity using ultrasound technology. Now this is cool: = Now this is scary. Wasnt something like this developed by NSA hacks to access devices OVER air that were not connected to the Internet at all? And Google thinks its a great new “feature?” The abuse factor for this seems epic and Google now “does” evil, it seems. they bought http://www.slicklogin.com/ for this! So Google can invade privacy even when you cannot hear it? Pssss. For clarification, the general idea of ultrasonic networking has been around for many years. As one example, Naratte was sending ultrasonic messages over emails, via videos on sites such as Vimeo, and through TV hardware years ago. The USPTO has numerous examples of using ultrasonic over the network to connect devices…well before last year. @terrytheengineer: Google won’t test it for “unfortunate consequences” at all and especially not health consequences. They are in too much hurry to profit to bother. When people begin reporting symptoms they’ll hire the same bunch of consulting scientists (like Exponent) that for decades have claimed no adverse effects from low-level pulsed microwaves based on rigged studies, all the time knowing they’re wrong because the military had it all mapped out back in the 50’s. Interesting! Thanks for sharing, Janko. The way it’s described here doesn’t make much sense to me. Based on what does chromecast play that pairing sound? Request from a mobile? How does the mobile know which chromecast to request for pairing? I like your articles. You always seem to have interesting tidbits that are not available anywhere else. I remember reading your article on the DIAL protocol way before chromecast was announced. did they comment on whether this would require new hardware or will existing chromecast sticks support this via a software update in the future? This is for the existing hardware.